There's nothing like a pretty bouquet of flowers to get my card-making mojo going! I found these "pretties" at style me pretty. Hope you'll join us this week using your Certainly Celery, Regal Rose, Very Vanilla, Rich Razzleberry & Pumpkin Pie! 2. Post it on your blog or other public gallery (Splitcoaststampers, Paper Craft Planet, Stampin' Addicts, etc.) 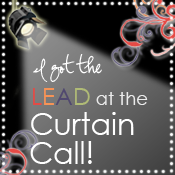 using the keywords Curtain Call 38 and make sure to include a link back here to the challenge. Please note the deadline will be Friday night. 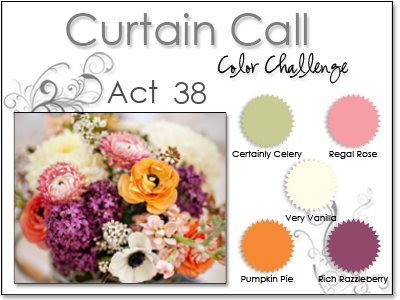 You have until Friday, July 16th before midnight (CST) to enter your Curtain Call Color Challenge: Act 38 project. 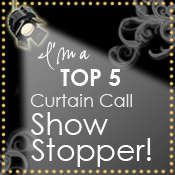 Join us for the Curtain Call Color Challenge: Act 38 and you could be one of the next Show Stoppers! We have two awards up for grabs plus a giveaway (details below)! Those chosen as "The Lead" and "Top 5" will receive an award to post on their blog(s) and share the exciting news! ...then play along with us and post your Curtain Call Color Challenge: Act 38 creation using Mr. Linky back here at Stacey's Stamping Stage. What a gorgeous combination of ribbons, especially the ribbon flower! I hope to play later this week if I survive my road trip! Great inspiration, as always! Love the ribbon flower...how'd you do that!!! Is that a new profile pic??? I've been out of the loop for so long I just now noticed it!!! Hope your birthday was fantastic, sure sounds like it was! Lovely card Stacey! Love that ribbon flower - must try that one! Glad to hear you had a great birthday! Such a pretty card, Stacey! I love the ribbon flower!! Great job with the colors!! Your card ist so beautiful. I love the color combo. Oooh, love the ribbon flower and all those yummy layers! Wowza, what gorgeous ribbon flower!! I'm having one of these lightbulb moments, thinking "why didn't I think of THIS before?!" Definitely need to case this idea :) By the way, I'm BACK!!! weee! A little song from Germany - i hope you have a nice day. First time playing. Thanks for a great challenge! I love the ribbon flower and bow on the card! Beautiful work as always!! Ohhhhhh I LOVE your ribbon flower! Another BEAUTIFUL card! Can't wait to play along! Great colours this week. I just couldn't wait to try them out. What a delightful color combination. I had a great time making this card. Love this color challenge Stacey!!! All the DT samples are amazing!!! Love your ribbon flower I need to try one soon! So Lovely! The dotted papers are so cute and just perfect on this card! This was quite the color challenge! I do really like though how bright it is! GREAT challenge! Fun bright colors this week Stacey...what fun to work with! An inspiring colour combo:) thanks!